Assess your deck building site thoroughly before you do anything. Whether you choose to build something simple or complex it all starts at the same point. Look at where you plan to build and any physical attributes or detriments that may affect the planning and design of the final vision. As you can see this was not a complicated deck to build. But it’s because of its simplicity that we think it makes a great example to show you how you should go about planning and building your deck - even if yours is much bigger and more complex. 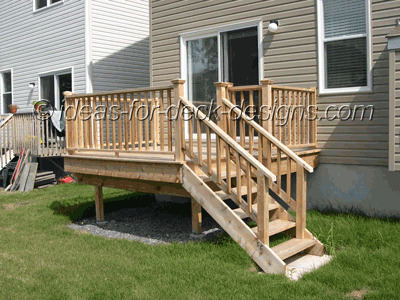 This deck was built on a newly constructed home. So we had the luxury of having very little interference from trees, fences or other obstacles. As you can see, the landscaper had laid out granular stone over top a landscaping fabric prior to starting to build. The site was flat. The lot was relatively small and close to the neighbors. The first floor of the house was about 42” above grade. There were no hydro lines or underground hazards to worry about. The soil, although rocky in places was predominantly clay. The location of the proposed deck was far enough from the neighbor’s property line and the set back of the building envelope that there were no problems. The orientation of the lot was full southern exposure. This may not be a great site location if you live far south where the sun can be intolerable. Even for this site, an awning would probably be a desirable addition to this proposed deck. OK, now that the key issues around the viability of this site have been covered off we are ready to move to the next stage of the deck building process – and the most important – creating our deck design based on our site assessment.